Deciding what’s worth the splurge and what’s not can be a tricky game. When you’re designing a small space, little details matter. 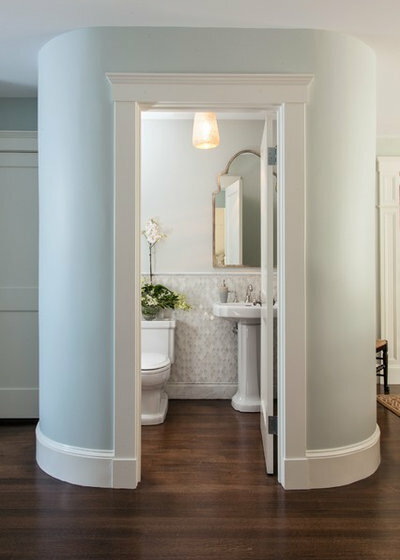 A powder room renovation is a great opportunity to create a jewel box of a space. Due to the limited square footage, you can feel more comfortable spending more for materials because you’ll need less of them. 1. Tiled walls. 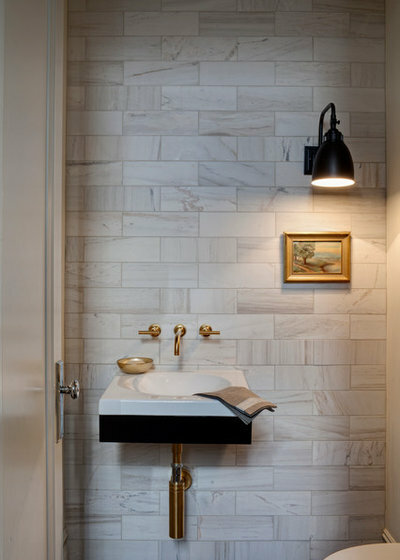 In such a small space, a little tile goes a long way. If you have perfectly intact flooring, consider adding a tiled element to the walls. Now is the time to pay a visit to your local artisanal-tile shop for a customized look. 2. Fixtures. Splurging on a brass faucet can give you a look you love. Think beyond the standard stainless steel or nickel fixtures and go for something bold. 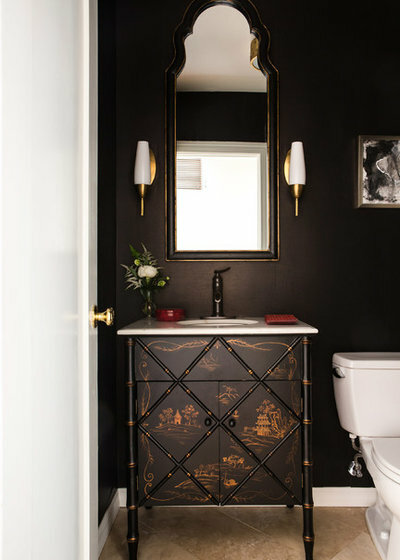 A brass faucet may wind up costing a bit more, but it’s bound to make a dramatic impact. 3. Storage. 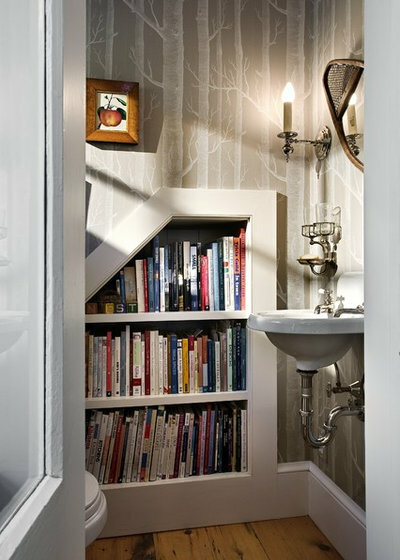 Whether it’s in the form of a built-in or your vanity, a little storage may be just what your bathroom needs. Adding this element will give you room to grow. You can make your tight space feel larger by having a place to hide all your toiletries. 4. Vanity. Not all vanities need to be that cookie-cutter standard white cabinet. Go for something you’ve always dreamed about. 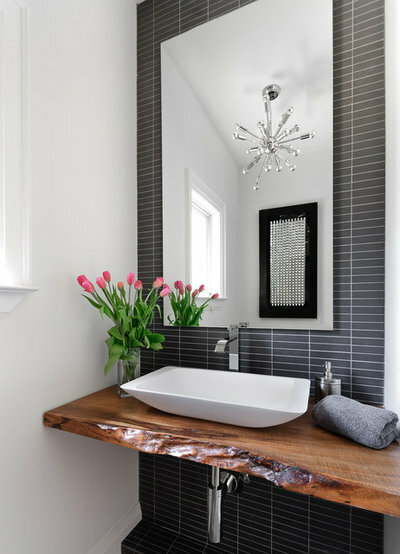 The cool live-edge counter is all this bathroom needs to make a big statement. 5. Wallpaper. Have you been lusting over a pretty floral print? An all-over pattern can crowd a large space. A small space may just be your ticket for whimsical wallpaper. 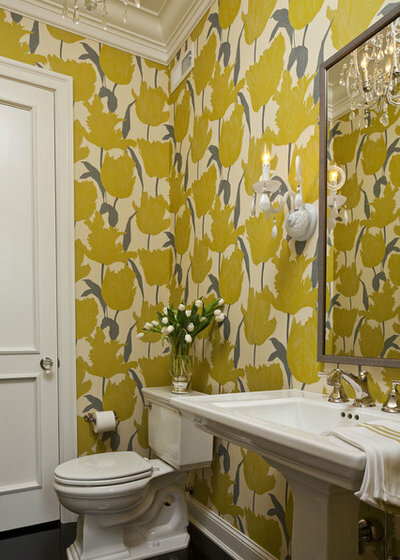 In a smaller space, wallpaper can add major style. 6. Flooring. If you’re taking on a full gut renovation, ripping up your floor can be daunting. Get past your fears by dreaming about what’s next. 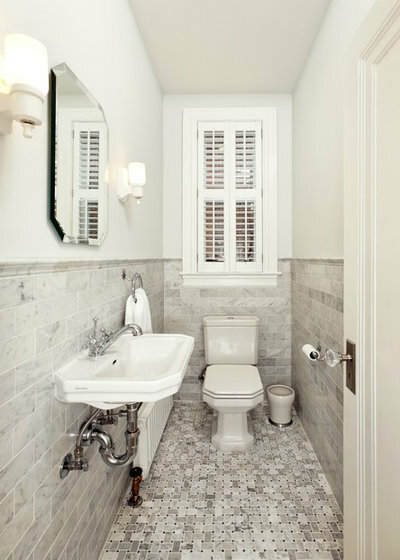 Lay down some high-end tile in your small space and let those fears slip away. 7. Artwork. Sometimes all your space needs is a piece of art or two. Hanging just one colorful piece can give you the space you so deeply desire. 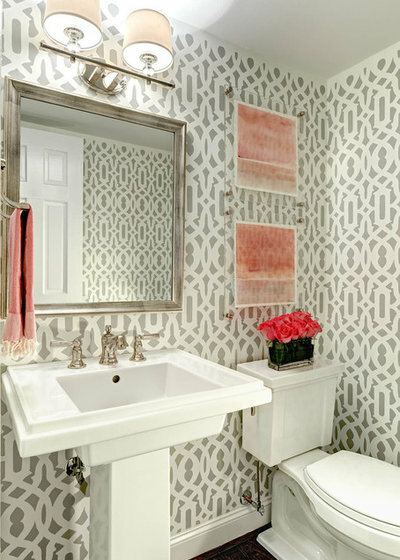 Splurge on artwork from your favorite artist and bring life to a dull powder room. 8. Mirror. This bone inlay mirror is swoon-worthy. It’s also totally splurge-worthy. A piece like this isn’t cheap. However, when it’s one of few elements in the room, it really makes an impact. 9. Lighting. Whether you’re in the market for a chandelier or a pair of sconces, don’t skimp. 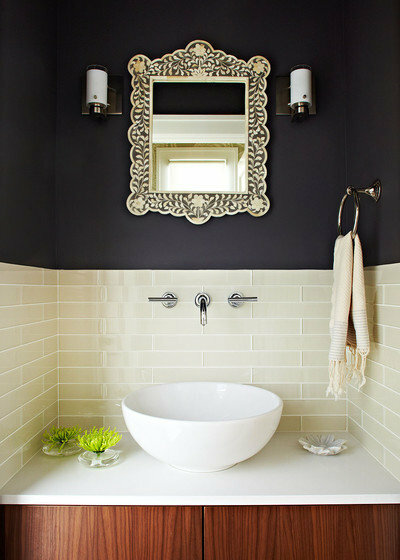 Good-looking lighting can provide some much-needed drama to your powder room. Hunt for the piece that speaks to your style. Don’t be afraid to dream big.